or visit our discussion forum at Trail Talk. Length: 2-8 miles, depending on path. No more than 4-5 hours to see the whole mountain, or under 2 hours to circle the top. 1-10 10 - you'll never hike this alone! 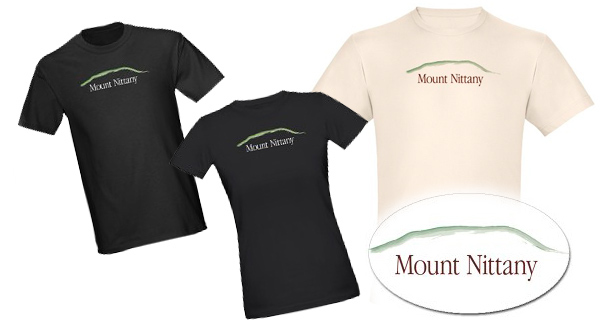 Mount Nittany is the first hike many people take in Centre County, PA. Its fame comes from the legend of Princess Nittany, and it is a landmark for the Pennsylvania State University, whose mascot, the Nittany Lion, is named for. Recently, directional signposts have been added for some added guidance on the trails. Hiking Mount Nittany is easy, compared to most of the other hikes near Penn State. Please note that this web site is all-volunteer, and the hosting is funded by the links from our advertisers and affiliates, so please check out the various links here and spread the word. use the GPS map at the top of this page. Find your way to Lemont, PA, near State College (off of route 26, east of State College). For directions, use the map to the left, or click here for 'door to door'. Once in Lemont, you'll find your way around easily, since there are only a few streets in this quiet town. Find Mountain Road off of Pike Street (the main street) and take it all the way to the end. After Mountain Road turns into a dirt road, you'll find a small parking lot near the trailhead. Park here, and lock up your stuff—this is a very popular hike, especially on nice days in the spring and fall. A child could hike Mount Nittany, since it's so well used, well marked, and popular. Don't let that go to your head! The climb is not the worst in the world, but for the beginner, it can take the wind out of you. Fortunately, the climb is a fairly short one (1000 yards to the top, 600 feet up), and should take somewhere between 18 and 30 minutes. Still, this is like climbing a 40 story building, so take your time. Open fires are prohibited on Mount Nittany, and while it is open to the public, it is privately owned, so please respect the wishes of the owners. To learn more, visit the Mount Nittany Conservancy and Lion's Paw web sites. The paths change from time to time to avoid erosion and overuse, so please stay on the current path, blazed white going up, and splitting into white and blue at several places. Signs and ropes cordon off the 'old' paths. Don't shortcut the switchbacks or 'bushwhack' on Mount Nittany—it destroys the trail and the mountain. As always, pack out your trash. Better yet, bring a trash bag and pack out the inevitable trash left by others. You'll have plenty of time at the top to have fun, but it is fairly tame by trail standards, so if you want something more "rugged," try the Mid State Trail or one of the numerous other trails in the area. Our sister site, Bill's Central Pennsylvania Hikes has a number of excellent hikes in the area. Once at the top, most people will go to the Mike Lynch Vista, about 100 yards to the right. Don't go that way unless you want a boring, short, and crowded hike. I recommend taking the road less traveled…go left! A white blazed path to the left will afford 2 excellent vistas, a small cliff, and a great view of the Nittany Mall before looping around the mountain. This is especially nice when the fall leaves are turning. Follow the white blazes for a mile or so until you reach a rock pile, or 'cairn', about 6 feet high. At this intersection, you can go in a couple of directions, so check out the map for a better idea of where it leads. It takes less than a half-hour to get to this section, so you can do it on a relatively short hike. The first option is to head downhill, taking the blue trail which will take you down a somewhat rocky path that leads to a dirt road and back to your car. Take this option if you're pressed for time or want to cut the hike short. The second option is to take the white trail to your right (assuming you are heading east, and came up the white blazed 'main' trail) for a shorter hike which loops back to the Mike Lynch Vista and a view of Penn State, Beaver Stadium and Happy Valley. The path back is just a nice walk in the woods, and not terribly exciting. You would do just as well to back track towards the Mike Lynch Vista and then climb back down the way you came up. The third option is my favorite. Keep going straight on the blue path for the a circuit hike of the entire mountain—it's worth your while if you haven't done it, and it's my favorite way to hike the mountain. This way is about 3 miles around the blue trail, for a total of about 4-5 miles. This makes for a nice, leisurely all-day hike, so bring a lunch, some water, and enjoy the mountain. If you took the second option and went right at the rock pile on the white trail, you'll find another fork in the paths after 3/4 of a mile or so. Take the blue blazed path to the left for a nice view of Tussey Ridge. This is where you would be had you taken the blue trail, or option three at the cairn. If you take the white path to the right, you'll get a boring shortcut back to where you started. This will make more sense if you look at the trail map, or if you've already hiked the mountain a few times. I prefer this path in the winter. There are numerous 'keep out' signs on the mountain on the blue trail, and a few on the white. These are for hunting seasons, and they have the dates clearly marked. Stay clear of those areas during the listed dates—usually in the winter—since you don't want to trespass or get shot. Other dates are fine, and hiking is encouraged. If you are concerned about hunting, hike on Sunday, when no hunting is permitted, or wear blaze orange. Really, it's not a concern, but I thought I'd mention it. The hunters are very much aware of the popularity of the trails, and to my knowledge, there's never been an accident. No matter which path you took, you'll eventually get to the 'popular' vista on the blue trail (the Mike Lynch Vista), which overlooks the Route 322 bypass, Beaver Stadium, the Bryce Jordan Center and Penn State. This is the best place to watch the sunset in Happy Valley, but it can be crowded. Don't expect to have it to yourself. If you're really into the Penn State tradition thing, camping is allowed on the mountain. It does get a bit windy, though, so be prepared! Watch out for "widow-makers", which are standing dead trees, as well. Otherwise, pitch your tent and bring along your favorite Penn State legends. In summary, there are two paths on Mount Nittany, keep to the white for a shorter, less interesting hike. Take the blue paths for the more interesting and longer hike. Note that the "blue trail" encompasses part of the white trail, but they are not blazed both blue and white, just white. If you stick to the small circle around the mountain, you can hike it in less than an hour. If you take the entire circuit, it takes about 3-5 hours. Your speed may vary. After your hike, go get some ice cream at The Creamery—you've earned it! Here's a cool video from YouTube that will give you a sense of the hike. Note that the folks took the path we recommend, starting on the blue trail. If this is your video, please contact us so we can give you credit! else you'd like to tell us. This is the legend, as told by Lion's Paw, which is pledged "To promote the welfare and best interests and to maintain and perpetuate the traditions of The Pennsylvania State University." The organization is largely responsible for saving Mount Nittany from contractors and lumber companies by starting the Mount Nittany Conservancy, together, they own the majority of the mountain. Nit-A-Nee enfolded him into her arms and carried his still erect body back to a place in the center of the Valley where she laid the strong Brave in his grave and build a mound of honor over his strength. Through the night they watched with awe as the Indian Brave's burial mound grew and rose into a Mountain penetrating the center of the big valley between the two legs of the Tussey and Bald Eagle Ridges. When the dawn finally came, a huge Mountain was found standing erect in the center of the Valley. A legend had been born. The mound and the maiden had given place to a Mountain, and standing on its summit was a Lion surrounded by eleven orphaned male cubs, each of whom had the courage of the fearless Indian Brave and the heart and strength of the mysterious Indian Princess. From this day forward every place in the valley was safe, and the wind wrested nothing from the fields on which these Lions strode as fearless heroes from the Mountain. The people of the Valley from that date forward knew only happiness and bounteous plenty. In the fullness of time, men and women came from across the farthest seas to build a college at the foot of this Mountain. The strength and courage of the students of this college became known far and wide. As each student learned the destructive power of the North Wind across the fields, each also learned the strength of the Princess known as "Breaker of the Wind," called in her language Nit-A-Nee, and the courage unto death of the Indian Brave called Lion's Paw. As long as this strength and courage is known in the Valley, Mount Nittany will stand as a breaker of the wind. This is the legend of Mount Nittany. May it stand forever high and strong in our midst, our breaker against the harsh winds of destiny and fate which sweep down from the north. May Mount Nittany ever rise above us as the Guardian before the gates of Old Penn State. May the mysterious Indian Princess ever stand in our midst as breaker and shield against the destructive power of the winds of fate. And may the Nittany Lion's cubs forever join in the games which are the guarantee of the life of the land we love. Need Penn State or Nittany Lion photos? 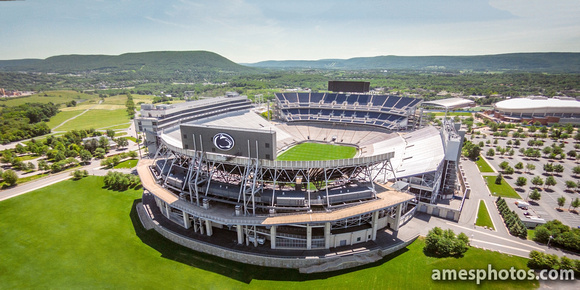 Purchase professional photos of Penn State icons from William Ames Photography. Penn State wedding photography also available. Here are useful links for Pictures of Gettysburg, Nittany Lion mascot, and Planning a Penn State wedding ideas? or Brisket Injection recipe?